Ashley Eva Brock is a fashion and costume designer, fiber artist, and educator. 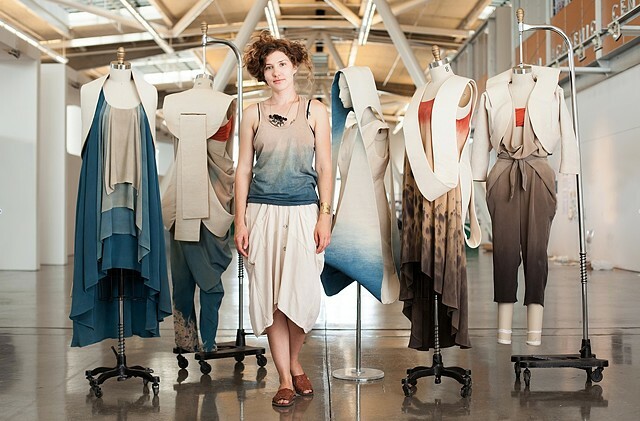 Her work focuses on natural fibers, natural dyes, and experimental approaches to both wearable and non-wearable objects, interweaving fine art and fashion, functionality and form, practicality and possibility. She holds a degree from the California College of the Arts in Fashion Design with a strong focus on Textile Fine Arts. Starting in 2018, she returned to her alma mater to teach Fashion Studio 3, and Conceptual Fashion Design. She has shown her wall-based work at places such as the Bolinas Museum, and Tartine Bakery in San Francisco and in publications such as the West Marin Review and Surface Magazine. Her body-based work has received several awards including The London Centre for Sustainable Fashion’s Fashioning the Future Award in 2011 and Surface Magazine’s Emerging Talent Award in 2012. She has worked as a dyer at the San Francisco Opera, and for clothing design companies such as Tea Collection and Gravel & Gold. She also freelances as a costume designer for music videos, performance and film, where she has designed and made costumes in collaboration with directors such as Andrew Thomas Huang (frequent collaborator with Bjork), and Nicole Perlman (emerging director, writer of Guardians of the Galaxy). She’s currently gestating a clothing company called Stone Ocean Sky.